When Greywalls reopened as a hotel in May 2010 it was as "Greywalls Hotel and Chez Roux Restaurant". The link with Albert Roux works very well in other hotels operated by Inverlochy Castle Management International, and it was no surprise to find on our visit to Greywalls that the quality of the food on offer, and the overall dining experience, was very high indeed. 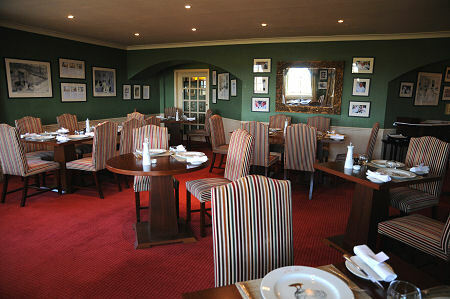 It was likewise no surprise when Chez Roux at Greywalls became the Scottish Hotel Awards Restaurant of the Year 2011. You can read our hotel review for Greywalls Hotel here. A number of dining options are available at Greywalls above and beyond the main lunch and dinner offerings, which we cover below. A "bar bites" menu is available throughout the afternoon and evening which offers everything from sandwiches to fairly substantial meals; and an enticing choice of afternoon teas is served throughout the afternoon in various areas of the hotel. To complete the range of options on offer, rooms service is available 24 hours a day, and private dining can be arranged in a number of locations within Greywalls. Most dining takes place in the attractive main dining room at Greywalls which forms the core of the Chez Roux Restaurant. The attractive decor and entertaining artwork (including many large size classic newspaper cartoons) is matched by comfortable chairs and a view out over the golf course at Muirfield. Dining accommodation can be extended by making use of the rather smaller original dining room, which can be found next to its larger sibling. Greywalls is open for lunch and dinner, to residents and non-residents alike. The principles behind the Chez Roux Restaurant involve local sourcing wherever possible, and value for money. Two menus are on offer. The "daily menu" changes, as the name implies, each day, and offers a three course lunch or dinner for a very reasonable fixed price, from a menu that on the day we visited included three starters, three mains and three desserts. The a la carte menu changes less frequently, and when we visited included four starters; three fish, three meat and a vegetarian main; and four sweets plus a cheese board. Our dining experience started in the superb surroundings of the library, where we made our selection from the menu while enjoying pre dinner drinks and some fine canapes. The dinner itself excelled in every respect. We discuss the food below, but it was complemented by outstanding service and by little extras (such as marvellous bread) that do so much to enhance the overall experience: and by comfortable seats. Our starters were "Pike Quenelle with Duxelle of Mushroom Brown Shrimp, Lobster Sauce" and "Albert Rouxs Soufflé Suissesse", and both were delicious. The same could be said of the mains of "Pan Roasted Saddle of Highland Venison, Creamed Celeriac and Cocotte Potatoes, Beetroot Jus" and "Supreme Free Range Guinea Fowl, Wild Mushrooms and Madeira Jus". For sweets we chose "Iced Grand Marnier Parfait, Orange Compote" and the "Ice Cream and Sorbet Selection". It is often the simplest things that are hardest to do really well: the ice cream/sorbet dish emerged as delicious strawberry and vanilla ice creams, and a coconut sorbet whose complex flavours were outstanding. The dining experience concluded where it had begun, with a choice of different coffees and petits fours in the library. Breakfast is served in the main dining room. Everything is table served, and the starter choices on offer included museli, porridge, yoghurt and a delicious plate of fresh fruit. Main course options included local smoked salmon or kippers, eggs Bendict or all the makings of the full Scottish breakfast. The fried breakfast was beautifully prepared exactly as ordered, with portion sizes sure to keep you going through the day. You can read our hotel review for Greywalls Hotel here. STB 5 Star Country House Hotel.